With the grand unveiling of the Galaxy Note 9 yesterday, Samsung also announced that it will be launching a major update for its smart assistant Bixby right out of the Note 9 box. The so-called ‘Bixby 2.0’ will bring upgraded skills including better natural language processing, quicker and more intuitive responses, as well as better predictions regarding what users want it to do. 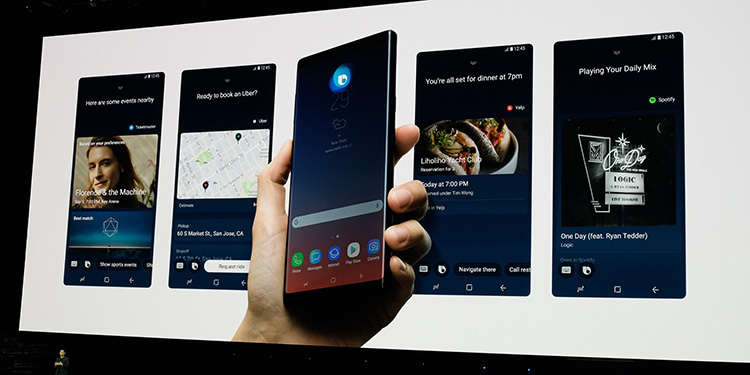 On the launch stage, Samsung showed some of the new skills in Bixby 2.0. Now, Bixby is more adept at following up to queries without you having to repeat the context again. This functionality is already available for Amazon’s Alexa and recently turned on for Google Assistant. Another great addition is the facility of recommendations which are contextual to the individual. For instance, if you prefer a specific cuisine, Bixby will recommend you the top-rated restaurants that serve you that cuisine. But the assistant will act like a truly smart assistant and auto-fill your details while reserving a table for you at the restaurant. It will automatically fill up information including time and the number of people depending on your choices in the past. The improved Bixby experience also includes assistance while hailing Uber rides and looking for nearby events. Back in October last year when Bixby was launched, Samsung said that it would act as a complete hub for controlling all the devices in your personal area. So it is designed to be a full-fledged butler for all your needs. Samsung has also reworked smart assistant from the point of its speed. But despite claims, Samsung’s press event told a different story. As per The Verge, Bixby 2.0 had responses and the executive on stage tried to distract the audience by prompting them to clap for its features amid an on-screen hiccup. Apart from speed, Samsung’s new assurances for the improvements in Bixby seem promising. We have to wait until we get to review the updated version to give you the final judgement.